Blosom the cow has many good qualities. She’s sweet. She’s kind and she is very friendly. But she also has a claim to fame that no other cow has. 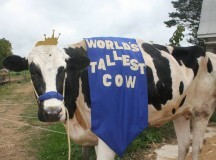 Blosom is officially the world’s tallest cow. She stands 190 centimetres or six feet, four inches tall “from the hoof to the withers,” according to her official certificate.